The trend towards nationalism following the proclamation of the 2nd Constitution in 1908 brought about new research in architecture and efforts to form a national architecture. These researches continued till almost 1930 in the early Republican period. Especially an understanding formed by the fact that elements from generally Seljuk and Ottoman architecture stand in the forefront with an elective method left its mark on the architecture of the Republican period till 1930. In this period, architects whose pioneers were architects Kemallettin and Vedat Tek endeavored to form a Turkish national fashion via National Architecture Renaissance by vitalizing classic Turkish architecture. This trend tried to apply architectural structures such as wide friezes, domes, steep arches, pillars, overhangs, tile wainscots, columns with stalactite vaulting from rather old religious structures to civil architecture. They gave importance especially to facade designs. Various arches used in Seljuk and Ottoman architectures, the importance given to entrances, marble pillars and usage of tile boards are typical characteristics of National Architecture Trend I. 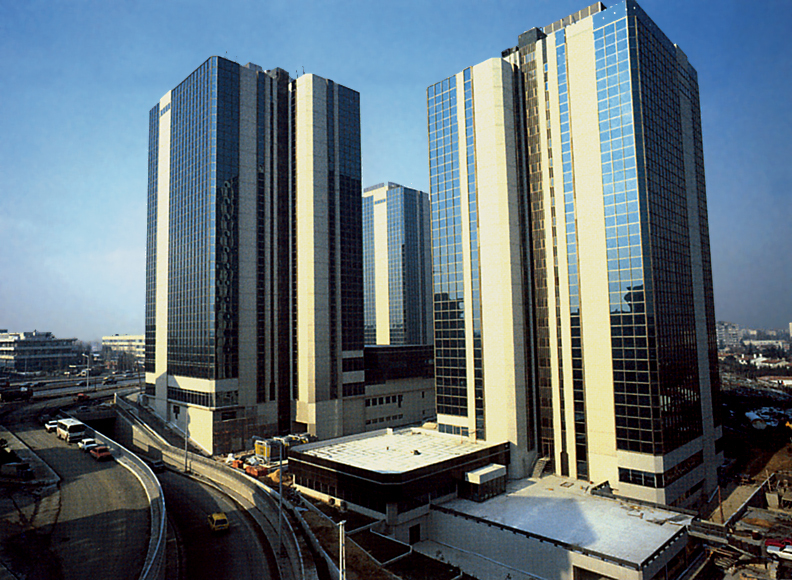 The trend was effective in public structures and it did not affect dwellings very much. 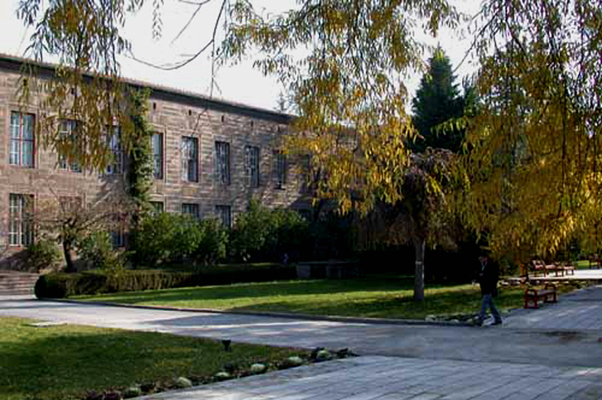 The pioneers of the trend, Kemallettin and Vedat, departed from the purpose of purifying the architecture of the country from foreign effect and were lead to domestic eclecticism and considerably affected not only the late Ottoman period but also the Turkish architecture in the first years of the republic. The Turkish movement lead by Ziya Gokalp and the support of the Republican Government enabled this movement to be alive during the first years of the republic. In fact, the path that was followed was not compatible with the innovative and progressing character of the young, dynamic republic. Young Republican architects carrying out reforms in every field were trying to create a new architecture by benefiting from Seljuk-Ottoman elements instead of Islamic-Ottoman elements used in previous periods. Other two architects, Arif Hikmet (Koyunoglu) and Giulio Mongeri of Italy stock similar to the architects mentioned above in terms of their understanding also participated in the movement. Architect Kemalettin built 4. 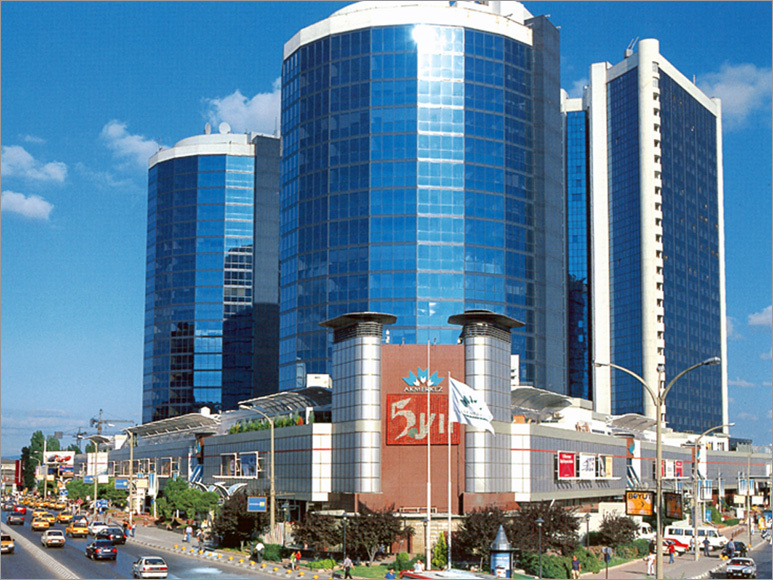 Vakif Hani, Bostanci and Bebek Mosques and Kemer Hatun Mosque in Tarlabasi, Tayyare Apartmans (Hotel Merit Antik today) in Laleli in Istanbul; DDY Headquarter and Gazi Terbiye Institute in Ankara. The most important buildings of the architect Vedat Tek are Buyuk Postane (Great Post-office) in Sirkeci, buildings of Denizcilik Isletmeleri (Maritime Business) in Karakoy, his own house in Nisantasi, Haydarpasa Vapur Iskelesi (Haydarpasa Steamer Wharf) and Ankara Palas which he began to build and was not able to complete. 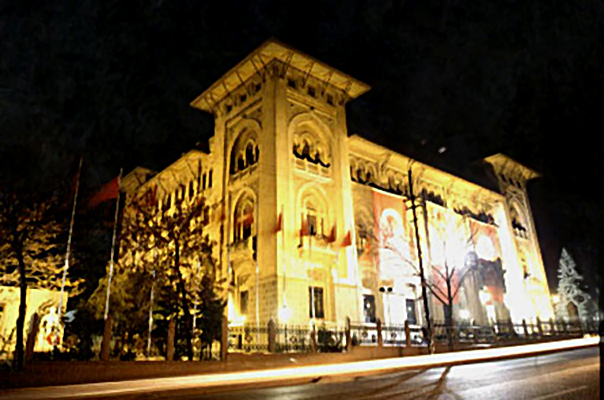 Arif Hikmet built Ankara Turk Ocagi [Ankara Turkish Society] (Devlet Resim ve Heykel Muzesi [State Art and Sculpture Museum] 1927-30 today) and Etnografya Muzesi [Etnography Museum] (1925-28) and old buildings of Hariciye Vekaleti [Hariciye Ministry] and Mongeri built Ziraat Bankası Genel Müdürlüğü [General Directorate of Ziraat Bank] (1926) Osmanlı Bankası [Bank Ottoman] (1926) in Ulus and Is Bank (1928) and Inhisarlar Basmudurlugu [Inhisarlar Office of General Director] (1928) in Ankara. As the necessity for buildings increased especially in capital city Ankara but the number of architects was insufficient, a period of foreign architects again began in 1927. In 1927, after Encouragement of the Industry Law came into effect, foreigners got the opportunity to work in our country and foreign architects increased their effectiveness in the country renovated after that date. These architects ensured an international architecture understanding to be dominant in parallel to the renovations that the state would carry out in every field. Architects such as Clemens Holzmeister, Ernst Egli, Theodor Jost, Hermann Jansen, Martin Wagner, Martin Elsaesser, Bruno Taut, and R. Oerley affected the architecture of young Republic in accordance with their personal inclinations via the duties they took on as an educationist, adviser, planner and enforcer. Especially thanks to the activities of Egli and Taut, a rationalist and functionalist architecture developed. Symmetrical plans, symmetrical facades bearing simple lines purified from adornments, rhythmic windows arrangement, straight or hidden bent roofs, monumental-scaled stairs, a pillared-arrangement in the entrance or pillars of few floors sometimes on facades are characteristics of this period. In this period, C. Holzmeister built Milli Savunma Bakanligi [Ministry of National Defense], Genelkurmay Baskanligi [Presidency of General Staff], Orduevi [officer's club also accommodating army members], Harp Okulu [Military Academy], Cumhurbaskanligi Kosku [Presidental Palace], Merkez Bankasi Central Bank], Icisleri Bakanligi [Ministry of Internal Affairs], Ticaret Bakanligi [Ministry of Trade], Yargitay [Court of Appeals], Emlak Bankasi [Emlak Bank], Avusturya Buyukelciligi [Austria Embassy] in Ankara in 1928-36 and won the project competition for The Turkish Grand National Assembly in 1938. 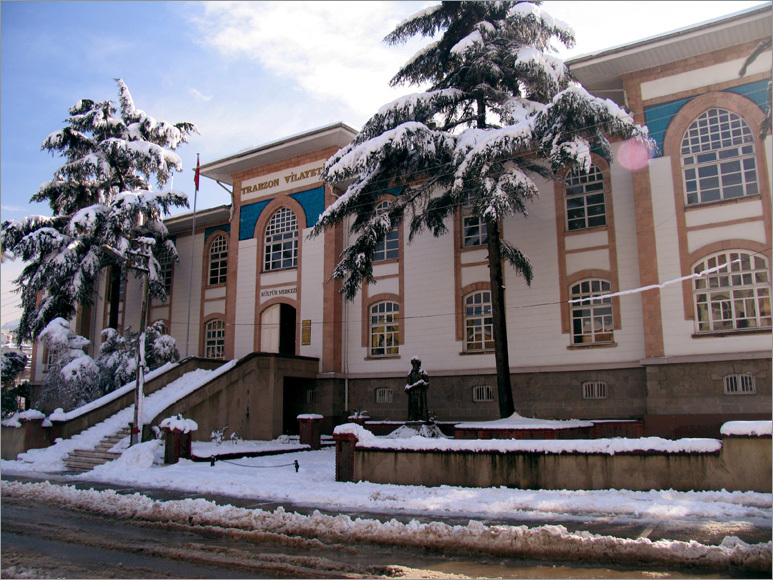 T. Jost built the buildings of Saglik Bakanligi [Ministry of Health] (1926), E. Egli built Musiki Muallim Mektebi (Musical Teacher Training Colllege), Sayistay [Court of Accvounts] and Ismet Pasa Kiz Enstitusu [Ismet Pasha Institute for girls] (1927-30) and B. Taut built Dil ve Tarih Cografya Fakultesi [The Faculty of Language and History Geography] in Ankara (1937). In 1930’s, some Turkish architects created new western examples based on cubism and reinforced concrete for almost 10 years in accordance with international and contemporary fashion. Ankara Sergievi [Ankara Gallery] (Sevki Balmumcu, 1933), Istanbul Universitesi Gozlemevi [Istanbul University Observatory] (Arif Hikmet Holtay, 1934), Florya Deniz Kosku [Florya Sea House] (Seyfi Arkan, 1934), Taksim Belediye Gazinosu [Taksim Municipality Night Club] and after all Kadikoy Halkevi [Kadikoy Community Centre] (Ruknettin Guney, 1938) and many other community centers and Yalova Termal Oteli [Yalova Thermal Hotel] (Sedad H. Eldem, 1935-38) are among remarkable buildings. An architectural understanding appropriate for political aims was not available in Germany and Italy during the World War II. This understanding stressing monumental, symmetrical and stone materials influenced many countries. The book called German Architecture [Alman Mimarisi] by Albert Speer, a famous German architect of that period, was published in German/Turkish in 1942, Paul Bonatz, again a German architect, arrived to Turkey to present his German Architecture Exhibition [Alman Mimarlik Sergisi] and lectured twice. II. National Architecture Trend was effective in 1940’s because of the reasons such as these outside influences and reactions against foreign architects being in the foreground with their activities till the recent times and the fact that the war atmosphere raised the national solidarity and the necessity to resort to domestic goods due to again war conditions. The trend was a fashion research based on the discovery and usage of domestic, national architecture elements. Studies called Milli Mimari Semineri [National Architecture Seminar], focusing on especially traditional Turkish civil architecture, founded and lead by Sedad H. Eldem in Guzel Sanatlar Akademisi [Fine Arts Academy] was very influential on the formation of basis of thought of this trend. Buildings such as Turkiye Pavyonu [Turkish Pavilion] (Sedad H. Eldem) in International New York Exhibition in 1939, Anitkabir [The tomb of Ataturk] (Emin Onat, Orhan Arda, competition, 1942), I. U. Fen ve Edebiyat Fakultesi buildings [Faculty of Science and Literature of Istanbul University] and Ankara Universitesi Fen Fakultesi [Ankara University Faculty of Science] (E. Onat, Sedad H. Eldem, 1943), Canakkale Zafer Aniti [Canakkale Triumph Monument] (Dogan Erginbas, competition 1944), Istanbul Radyoevi [Istanbul Broadcasting Studios] (Ismail Utkular, Dogan Erginbas, Omer Gunay, competition 1945), Sisli Camii [Sisli Mosque] (Vasfi Egeli, 1945- 49), Istanbul Spor ve Sergi Sarayi [Istanbul Sport and Exhibiton Hall] are among remarkable examples. The disintegration in the Second National Architecture began in 1948, when the rational project jointly prepared by S. H. Eldem and E. Onat for the Istanbul Adalet Sarayi [Istanbul Court of Justice] was the best in the third competition and the trend absolutely ended with a competition for Istanbul Belediye Sarayi [Istanbul Municipality Palace] in 1952. In 1950’s the Turkish architecture would be directed towards rationalism under the influence of Modern Architecture that was becoming widespread in Europe and USA and would build this kind of constructions. The World War II was over and Turkey began to be politically and culturally systematic about the West more and more. Istanbul Belediye Sarayı [Istanbul MunicipalityPalace] (Nevzat Erol, competition, 1952), Istanbul Hilton Oteli [Istanbul Hotel Hilton] (SOM and Sedad H. Eldem, 1953), Buyukada Anadolu Kulubu [Buyukada Anatolian Club] (Turgut Cansever, Abdurrahman Hanci, 1953), Sakarya Hukumet Konagi [Sakarya Government House] (Enis Kortan, Nisan Yaubyan, 1956), Turkiye Pavyonu [Turkish Pavilion] in Brussels World Exhibition (Muhlis Turkmen, Utarit Izgi, Hamdi Sensoy, Ilhan Turegun, 1958), DSI Genel Mudurlugu [General Directorate of State Water Works] (Enver Tokay, Behruz Cinici, Teoman Doruk, 1959), Tekel Genel Mudurlugu [General Directorate of Tekel] in Istanbul (Ilhan Tayman, Yilmaz Sanli, 1959), Kizilay- Emek skyscraper (Enver Tokay, 1959) are typical examples of this period. 1950’s was a rationalist period based on international criteria nourished by mainly foreign influences and effects on Turkish architecture. Ideas and works of world-renowned architects such as Rohe, Wright, Aalto, Le Corbusier, Niemeyer influenced the Turkish architects through media. 1960’s was a period of searching for a fragmented form and estranging from rationalism. 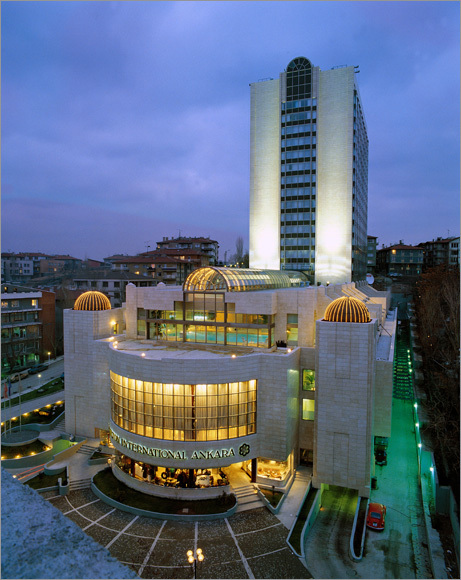 Istanbul Vakiflar Oteli [Istanbul Charity Hotel] (Ceylan Intercontinental today, AHE, 1959), Istanbul Manifaturacilar Carsisi [Istanbul Drygoods Bazaar] (Dogan Tekeli, Sami Sisa, Metin Hepguler, 1959), Buyuk Ankara Oteli [Great Ankara Hotel] (Marc Saugey, Yuksel Okan, 1960), ODTU Kampusu [the Campus of Middle East Technical University] (Behruz Cinici - Altug Cinici, 1961), SSK Zeyrek Tesisleri [Social Security Organization Zeyrek Facilties] (Sedad H. Eldem, 1963), Ankara MSB Tandogan Ogrenci Yurdu [Ankara MSB Student Dormitory] (Sevki Vanli, Ersen Gomleksizoglu, 1966), Turk Tarih Kurumu [Turkish History Association] (Turgut Cansever, Ertur Yener, 1967) can be considered among remarkable buildings of 1960-70 period. In this period, search for rationalism was intensive to harmonize Modern Architecture with the domestic data. It is considered that examples of pluralism based on postmodern and foreign influences became more prevalent after 1970’s. Postmodernism, being widespread in the West in 1970’s, was demanded in 1980-90 in Turkey. 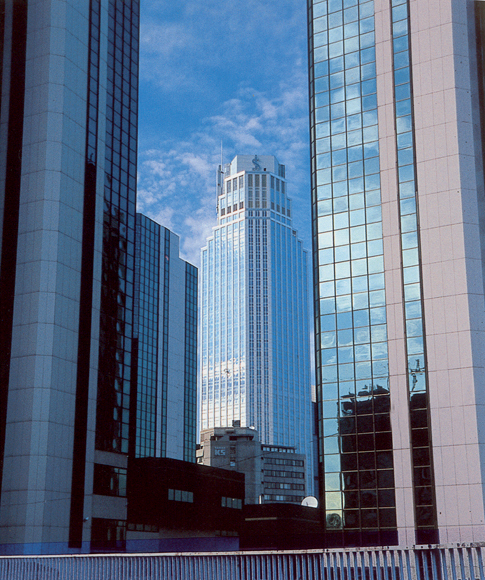 There were architects who constructed buildings in parallel with western-rooted trends such as late modernism, postmodernism and deconstructivism. In general, in spite of successful buildings separately, modern Turkish architecture was adversely affected from the unsystematic fast development of the society and cultural disintegration. Delayed industry revolution and excessive population growth brought about unsystematic, unplanned, dense, anarchic urbanization and social bounces. In recent years, architecture was tumbled into turmoil where everything, especially tourism buildings, was experienced consciously and unconsciously in many fields, because of the erosion of ethical values of Turkey, as in foreign countries, with the adverse effects of early globalization.